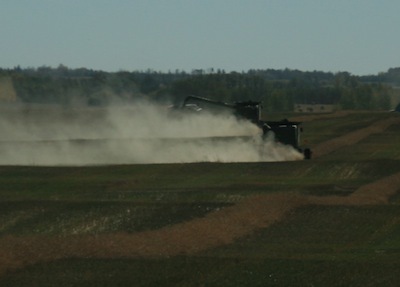 Harvest losses can add up quickly, especially if combines are pushed beyond their most efficient operating capacity. Slowing down even just 0.5-1 mph can go a long way to reducing losses, and the bushels saved can more than make up for the extra time. Once you’ve put canola into bins and bags, the work isn’t completely done. All canola in bins should be aerated, if possible, to cool it down to a safe and even storage temperature. Canola in bags can’t be aerated, but it should still be monitored. 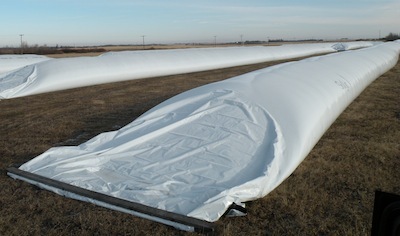 Bags can provide safe storage for up to a year if the grain is dry and cool. If canola has higher moisture, monitor bags closely and considering moving canola within a few months. Disease assessment is best done before or during swathing. 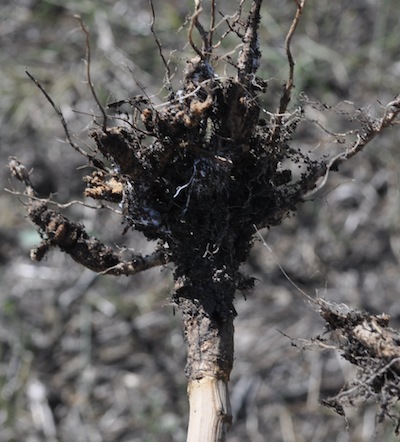 After the crop is swathed, root and stem material will start to decompose, making it harder to accurately identify diseases presence and severity. If the crop is already swathed, checking it now is better than waiting another week. Our Tweet of the Week comes from @AlbertaCanola. 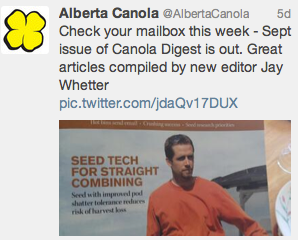 Thanks for the Canola Digest plug. 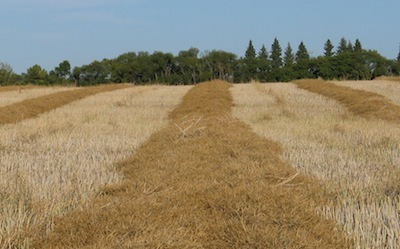 The cover article looks at everything we know, so far, about straight combining canola. 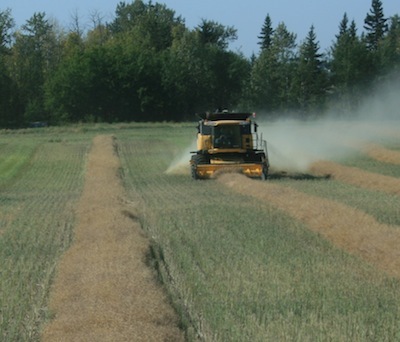 Send us a tweet to @CanolaWatch with the hashtag #straightcutcanola if you have more straight combining tips to share. Canola growers often lose 2 bu./ac. out the back of the combine. Losses can easily reach 5 bu./ac. if the combine is pushed beyond its threshing capacity. Every combine will have a sweet spot where the settings and ground speed are just right for the conditions and losses are within the acceptable range of 0.5-1 bu./ac. The only way to find that sweet spot is to first set the combine concave spacing, cylinder/rotor speed, fan speed, and sieve and chaffer spacing to match the canola harvesting conditions. And then second, to get out and measure the losses. Must canola cure 2-3 weeks? The question is, how soon is too soon to combine after swathing? There is not set length of time that canola must stay in the swath before combining. If moisture is below 10% and green is below 2%, go combining. Two to three weeks of curing is just an estimate. 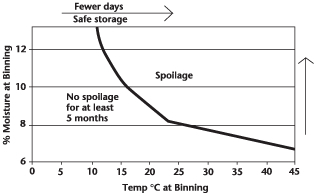 Canola at 10% moisture is at risk of spoilage when binned at 20°C. At 25-30°C, the spoilage risk is that much greater. Canola at 8% moisture is also at risk if not cooled immediately after storage. The first 4-6 weeks are critical. Canola in storage keeps respiring during that time, releasing moisture into the air around the seed. This moisture moves with air currents inside the bin, and in the fall and winter, this moisture concentrates at the top of the central core. How long to store canola in bags? —Harvest bags are best used as a short term storage solution under Prairie conditions. —Dry canola (less than or equal to 10% moisture) can be stored for up to eight months and 12% moisture content canola can be stored for up to five months without any significant change in quality or grade using harvest bags during autumn and winter. —Canola above 12% moisture content should be stored only for three to four weeks in the harvest bags to avoid quality and quantity losses. What’s needed to re-activate green-clearing enzyme? 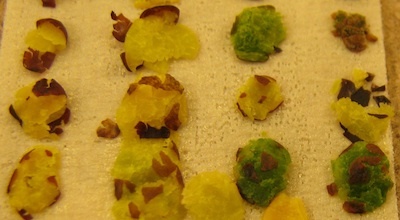 Cutting canola hot can lead to fast dry down, which can trap green in the seeds. If canola green counts are still high (No.1 canola requires 2% or less) and seed moisture levels have dropped below 10%, further green clearing is unlikely…unless conditions change. Canola seed moisture needs to get back up to 20% with temperatures remaining at 15°C or warmer for chlorophyll-clearing enzymes to restart and produce significant curing. An inch of rain will not lift canola at 7-8% moisture anywhere close to 20%. Several days of heavy dew, high humidity and additional rain events may be required. Lots of sclerotinia stem rot. 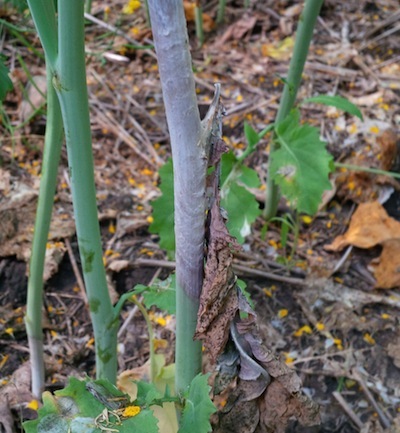 As harvest progresses, we’re hearing reports of higher levels of sclerotinia stem rot in some regions. Some fields that did not get a fungicide spray are at 40-50% infection. That works out to an estimated 20-25% yield loss, or 10-13 bu./ac. on a canola crop with 50 bu./ac. yield potential. Fungicide applications for sclerotinia stem rot may not provide a return on investment every year. But if conditions leading up to flowering suggest an elevated risk, spraying is warranted. Conditions after flowering are almost impossible to predict, so we can’t predict sclerotinia stem rot severity at flowering. But using the example above, one properly-timed spray can pay for 10 years worth of fungicide applications.